Published: June 8, 2015 at 02:39 p.m. Updated: Oct. 24, 2018 at 12:01 p.m. In honor of the 2018 World Series, let's take a look at current NFL stars and former NFL first-rounders who were drafted in baseball. Most recently, Seattle Seahawks quarterback Russell Wilson was acquired by the New York Yankees in a trade with the Texas Rangers. Wilson played for the Yankees in spring training this March. MLB draft: In 2012, Thompson was drafted by the Boston Red Sox in the 18th round. NFL draft: He was a first-round pick (25th overall) by the Carolina Panthers in the 2015 Draft. Skinny: Thompson went 0-for-39 with 37 strikeouts in one season of rookie ball in 2012. Baseball draft: Wilson was was drafted twice as a middle infielder -- out of high school in the 41st round by Baltimore in 2007, and then in the fourth round by Colorado in 2010. NFL draft: He was a third-round pick (75th overall) in the 2012 draft, by the Seattle Seahawks. Skinny: At one point, there were those who thought Wilson's best career move was to play baseball, not football. He played two seasons of minor-league ball (2010-11) in the Rockies' organization, and it was his offseason attention on baseball that led then-North Carolina State coach Tom O'Brien to suggest that Wilson finish up his college football career elsewhere (he did, at Wisconsin). At this point of his football career, Wilson looks like one of the best third-round picks in recent memory. NFL draft: Brady was a sixth-round pick (199th overall) by the New England Patriots in the 2000 draft. Skinny: Brady was a good high school catcher (he hit left-handed, and with power), but always liked football more and played only football after high school. That was a smart decision, as he has five Super Bowl rings and is a sure-fire first-ballot Pro Football Hall of Famer. Baseball draft: Winston was a 15th-round pick out of high school by the Texas Rangers in 2012. NFL draft: He went No. 1 overall to the Tampa Bay Buccaneers in the 2015 NFL Draft. Skinny: Winston was a high school baseball player of some renown in Alabama and even served as the closer and a designated hitter for Florida State's highly-ranked baseball team in 2014. MLB draft: In 2004, Cassel was drafted by the Oakland Athletics in the 36th round. NFL draft: He was a 2005 seventh-round pick (230th overall) by the New England Patriots. Skinny: Cassel was the starting first baseman for the Northridge, CA. team that reached the 1994 Little League World Series. They lost the championship to Venezuela. Baseball draft: Decker was drafted twice in college as an outfielder -- in the 39th round by Milwaukee in 2008 and in the 27th round by Minnesota in 2009. NFL draft: He was a third-round pick (87th overall) in the 2010 draft, by the Denver Broncos. Skinny: Decker played football and baseball in college at Minnesota and has become a solid NFL wide receiver. He has 385 receptions and 52 TDs in seven seasons. Baseball draft: He was a 43rd-round pick by the Chicago Cubs as a pitcher in 2009. NFL draft: Kaepernick was a second-round selection (36th overall) by the San Francisco 49ers in 2011. Skinny: Kaepernick was a better baseball pitcher than football quarterback in high school in Turlock, Calif., but he liked football more and received a scholarship to Nevada (ironically, the offer came after a Wolf Pack assistant saw him star in a basketball game). He didn't play baseball at Nevada but still was drafted in '09, when he was a college junior. Baseball draft: Tate was drafted twice as an outfielder -- in the 42nd round by Arizona out of high school in 2007 and in the 50th round by San Francisco in 2010. NFL draft: He was a second-round pick (60th overall) by the Seattle Seahawks in 2010. Skinny: Tate was drafted by the Arizona Diamondbacks after high school even though he missed his senior season of baseball with an injured thumb. He then played baseball in his first two seasons at Notre Dame before deciding to concentrate on football. He has 445 receptions and 29 touchdowns in seven NFL seasons. Baseball draft: Weeden was a second-round pick in 2002 by the New York Yankees. He spent four seasons in the minor leagues as a pitcher, playing in the farm systems of the Yankees, Los Angeles Dodgers and Kansas City Royals. NFL draft: He was first-round pick (No. 22 overall) by the Cleveland Browns in the 2012 NFL Draft. Skinny: With his baseball career stuck in A-ball, Weeden enrolled at Oklahoma State in 2007 and was a full-time starter during the 2010 and 2011 seasons. When the Browns selected Weeden in the 2012 draft, he became the oldest (28 years old) player ever selected in the first round. Baseball draft: He was a 26th-round pick as an outfielder by the New York Yankees out of high school in 1995. NFL draft: He was the 11th overall pick in the 1999 draft, by the Minnesota Vikings. Skinny: Culpepper, who also played basketball at Ocala (Fla.) Vanguard High, had a celebrated college football career at UCF, then put up some huge numbers while with the Vikings for a few seasons (2000-04). Baseball draft: He was drafted twice as an outfielder -- in the 18th round by Kansas City out of high school in 1979 and in the second round by the New York Yankees in 1981. NFL draft: Elway was the No. 1 overall pick in the 1983 draft, by the Baltimore Colts. Skinny: Elway didn't want anything to do with the Colts, so he used his baseball talents to force a trade to the Denver Broncos. He took the Broncos to five Super Bowls (they were 2-3 in those games) and was inducted into the Pro Football Hall of Fame in 2004. Baseball draft: Sanders was drafted twice as an outfielder -- in the sixth round out of high school by Kansas City in 1985 and in the 30th round by the New York Yankees in 1988. NFL draft: He was the fifth overall pick in the 1989 draft, by the Atlanta Falcons. Skinny: "Neon Deion" is considered one of the best cornerbacks in NFL history and was inducted into the Pro Football Hall of Fame in 2011. Sanders also played parts of nine seasons in the major leagues. He is the only player in history to play in a World Series and a Super Bowl, and in 1989, he became the only player in history to hit a homer in the majors and score a TD in the NFL in the same week. MLB draft: In 2004, Moore was drafted by the Anaheim Angels in the 22nd round. NFL draft: Moore was signed by the Dallas Cowboys as an undrafted free agent in 2007. 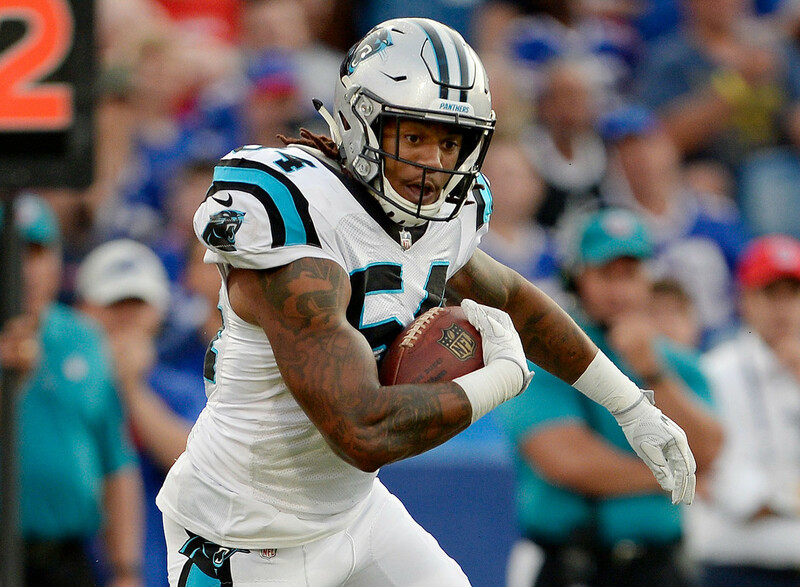 Dallas cut him before the season, but the Carolina Panthers picked Moore up on waivers. Baseball draft: Jackson was a fourth-round pick as an outfielder out of college by Kansas City in 1986. NFL draft: He was the No. 1 overall pick in the 1986 draft, by the Tampa Bay Buccaneers. Skinny: As with Elway, Jackson wanted nothing to do with the NFL team that drafted him. But unlike Elway, Jackson played major league ball instead. He ended up playing seven years in the majors and parts of four in the NFL. He was the MVP of baseball's All-Star Game in 1989. Baseball draft: He was a fourth-round pick out of high school as a pitcher by Kansas City in 1979. NFL draft: Marino was the 27th overall pick in the 1983 draft, by the Miami Dolphins. Skinny: Gee, here's a surprise: Marino (who also played some shortstop) had a good fastball in high school. But he put his right arm to good use in the NFL, where he was an MVP, took the Dolphins to the Super Bowl and was named to nine Pro Bowls. He was inducted into the Pro Football Hall of Fame in 2005.